While this accompaniment serves a practical function in maintaining a regular tempo it also creates a mood which serves to bring out a musical response in the soloist. It is the canvas on which the tabla player paints his depiction of the taal. 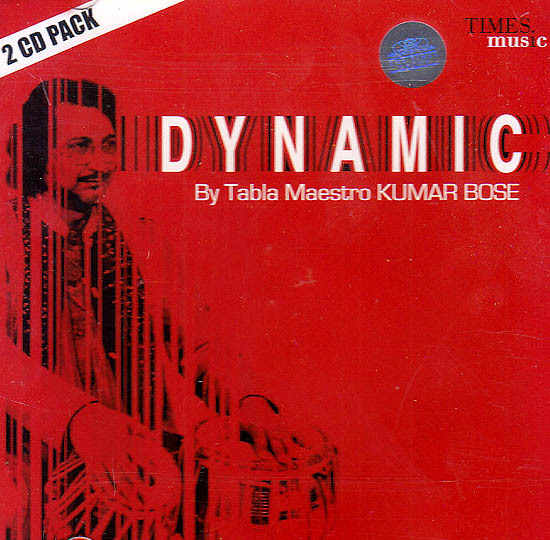 Throughout the performance Kumar Bose announces his compositions by referring to the tabla syllables that form the basis of the compositions occasionally reciting them in full. The first CD is mainly comprised of theme and variation type compositions using small phrases as the basis for elaborate and expansive improvisations. The second CD contains more traditional pre composed pieces. Many of these compositions have been written to accompany the rhythmical movements of Kathak dancers and are a specialty of the Benares traditions which Kumar Bose Most ably represents. Kumar Bose is the most established disciple of the legendary tabla maestro Pandit Kishan Maharaj belonging to the Benaras school or gharana of tabla playing. Out of the six established tabla gharanas, Benaras has most successfully managed to maintain its original stylistic purity and this is largely due to Kumar Bose and his contemporaries. His tabla solos are characterized by a skillful balance between the two drums (tabla and bayan). The warm tones of the left hand bass drum are complimented with the complex syncopation of the higher pitched right hand drum. Remarkably this is the first live recording release of Kumar Bose. It gives us a unique insight into his mastery as a soloist bringing out not only rhythmical characteristics of the instrument but also the intonations and subtle modulations that are essential in the musical appreciation of the tabla. The solo is played in a rhythmic cycle of sixteen beats known as teentaal. This is the most popular frameworks for improvisation used by tabla players because of its great scope for elaboration. The tabla is accompanied by a cyclic melody in sixteen beats called lehara played simultaneously by sarangi and harmonium. Apart form the sitar the sound of the tabla has come to be globally recognized as being representative of Indian music. Since its introduction into North Indian classical music in the eighteenth century the tabla has established itself as the most versatile of Indian percussion instruments. In the hands of a maestro the tabla has the capacity for seemingly limitless improvised permutations based on its distinctive grammar of syllables. With its expressive tonal inflections and melodic nuances it is now widely acknowledged throughout the world music community as one of the most complete percussion instruments. Kumar Bose has played a significant role in affirming this perception. His virtuoso talents first came to attention with his flamboyant performances as Pandit Ravi Shankar’s accompanist in the 1970s. The legendary sitarist was largely responsible for encouraging tabla players to be more expressive and expansive in their accompaniment Kumar Bose became a perfect foil for Ravi Shankar’s ground breaking experimentations.